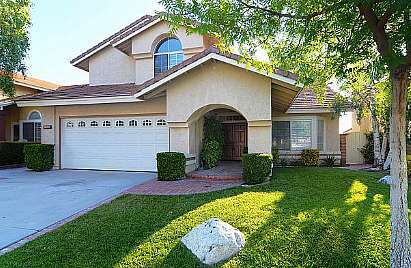 Awesome STANDARD SALE view home in Mountain View tract! Popular Plan 305 model is 2,214 sq/ft, 4 bedrooms and 3 baths (one bed & bath downstairs) and recently updated/upgraded with 20" tile and plush carpet throughout, crown moulding, new baseboards and door/window casings, and much much more! Large open kitchen with faux finished cabinetry, new granite counters, stainless appliances, 9" deep cast iron sink, and expanded island top for bar seating. New ceiling fans and light fixtures throughout the home, as well as rocker switches and new outlets throughout! Master bath has been remodeled with gorgeous tile and granite counters, and new faucets & toilets throughout. The backyard is easily pool sized and has a great western view behind it! No HOA here, and no waiting for a bank to get back to you on your offer either! Come and see this amazing home!